This is a flexible, summery vegetarian recipe that works well as a light lunch or an accompaniment to a family supper. Set a wide pan over a low heat. Once hot, add the olive oil, garlic, onion, cumin seeds and chilli or cayenne and gently fry for 12 minutes or until the onion is soft and golden. Meanwhile, put the tomatoes in a large bowl. Cover with boiling water and prick each tomato with a sharp knife. Leave for a minute then drain and peel off and discard the skin. Roughly chop the tomatoes and mix into the softened onions. Season and fry briskly for about 8 minutes or until the mixture forms a thick paste. 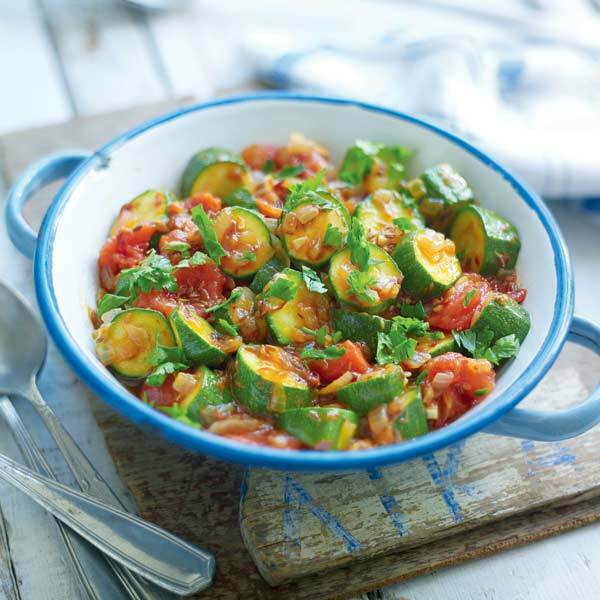 Cut the courgettes into chunks or slices. Mix into the tomatoes and fry briskly for 4 minutes or until very lightly cooked. Season to taste and stir in the parsley. Tip into a bowl and serve hot, warm or cold. As a light meal on its own, this works really well with a fresh, young rosé. try one from the south of France, preferably Provence.